Your garage door goes through a lot. Dings, bumps, rain, heat and freezing weather all take their toll. Over time cables fray, tracks become bent and springs lose their tension. A garage door is more complicated than you think and minor damage can prevent your door’s ability from functioning correctly. Faulty garage doors are not only a hassle, but have the potential to cause harm to you or your family. Every year, garage doors cause around 20,000 injuries according to the U.S. Consumer Product Safety Commission. The door won’t open or close. When a garage door has trouble opening or closing, you know it is time for a repair. Depending on whether you have a manual or automatic garage door, there is a variety of reasons behind why a door might not function correctly. The rollers are off the tracks or the door becomes stuck. Garage doors typically get knocked off their tracks from damage or gradually twist off their tracks over time. To fix the problem may require just a slight adjustment or a complete replacement of the track. The automatic door is slower or louder than before. A slow, straining automatic garage door opener is a sure sign you need to call in a professional. A slow door might mean your opener’s motor needs servicing, while excessive noise frequently points to the need to adjust or replace your hardware. The torsion springs are stretched or broken. Garages have one or two torsion springs with an average lifespan of around seven years. When these break or stretch too far you need to avoid using your garage. Call a professional to repair the damage and never attempt to do it yourself. The automatic reverse is malfunctioning. The automatic reverse on your garage door helps to prevent people and animals from being crushed when the door lowers. Operating a garage with a non-working automatic reverse can cause severe injuries. Please don’t attempt to repair any of the garage door problems which you find by yourself. 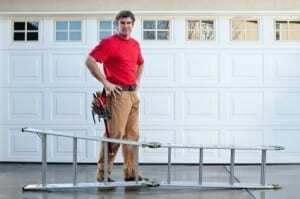 A garage door is exceedingly heavy and can instantly cause injury if it falls without warning. Springs are under high tension and become deadly weapons if they abruptly snap and hit someone. The best option is to always call a professional who has the experience and the equipment to fix your garage door safely and correctly. Action Garage Door Repair Specialist has been serving the Dallas/Fort Worth, Austin, and Houston areas in Texas since 1984. They can service any brand of garage door. Each qualified technician is fully insured , and all work comes with a guarantee in writing. Contact a member of the team to find out the closest Action Garage Door Repair Specialist near and get a free estimate.